My little girl was so quiet the other day. She’s never quiet. “Mommy, how do I mail this to him in heaven?” she asked hopefully. My heart sunk a bit. At four years old, she wears her heart on her sleeve. She nodded. She was okay with that. Thankfully. It made her happy that her Poa Poa would be able to read it. I glanced down at her letter. She had written the only sentence she knew how to write: I LOVE U. 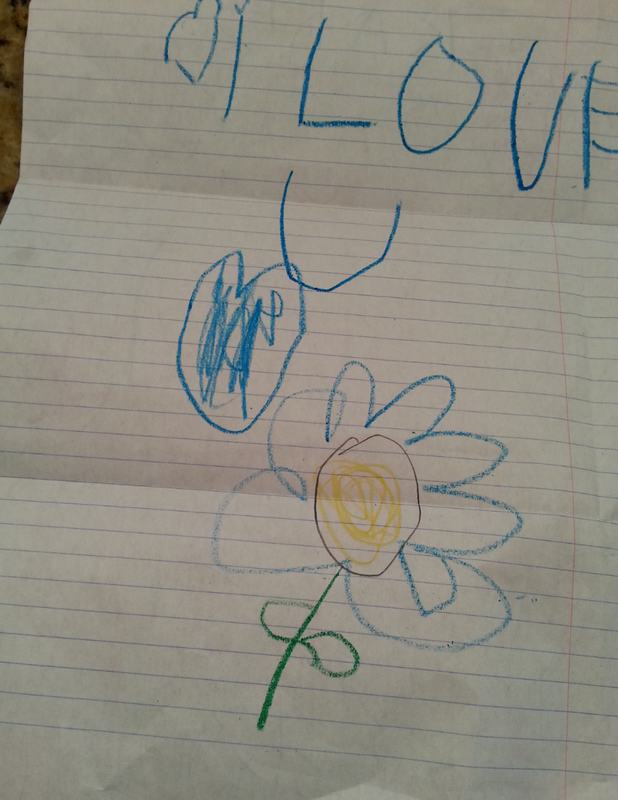 She had drawn a heart and a flower with seven blue petals. The letter was sparse. But her crayon markings were purely heartfelt. I have no doubt, she had totally, completely, honestly poured out her whole heart onto that paper. And if she could, I am sure, she would have sent that letter first class, priority mail directly to heaven’s front porch. It brings tears to my eyes as I write this. Thinking back on this past Sunday, I remember a conversation I had with this sweet-spirited older woman at our church. She and I have only talked a few times. “I love you, Kim! God bless you!” she had said as we ended our conversation. Her words were a little surprising. But it made me think. When we see someone through God’s eyes and love them as He does, we are in a way, sending a love letter to heaven. It honors and blesses Him. It is His commandment. It brings Him joy when we choose to love each other. And especially, I think, when we take the time to brave those words and really mean it. There is nothing greater. Sometimes it’s as easy as a love a little girl has for her dear grandfather. Sometimes I know, it can be so much harder. But yet, either way, it is truly a gift to be able to share these words with each other while we can. Thank you Abby. I have been enjoying your blog as well! Oh, Kim, her sweet letter brought tears to my eyes as well. Three little words that we are often so reluctant to share. But I completely agree, it is a truly a gift to be able to share these words with each other while we can. Thank you for this beautiful reminder today. Aww … glad you liked this. Her letter made me tear up as well. The innocence and transparency … it just teaches me so much! I can say that I LOVE this post! It’s always amazing what we come to understand in new and better ways through the innocence of a child’s eye. Thank you for sharing such a wonderful message. Thank you! It is amazing for sure. I think God uses the smallest of us to show us big truths about Himself. I also think we can learn a great deal from animals too :). Samuel knew what was going on when he was brought back. Thank you! I have been gaining a lot of insight from your blog. Keep up the great work. Beautiful…thank you for sharing a story that is sweet but also probably heartbreaking for you to retell.I love how a four year old can call us to speak those words that can come with ease or difficulty through a touching story of writing a letter to her Gung Gung. By the way–it is fun to hear what other people call their grandparents. My family is Czech and we call our Grandmothers Babi (Buhbee) and our Grandfathers Deda (Jeda). People look at my kids so funny when they here them talk about their Babi and Deda! Thank you Amy! I am amazed at how much God teaches me through my children. It is absolutely humbling at times. Buhbee and Jeda …I love it! I love how it changed into words all their own. I had to learn how to say Gung and Poa Poa (actually pronounced Po Po) as these are names my husband grew up with. 🙂 The diversity is pretty interesting! Yes grandma was able to send back a letter to my daughter to let her know she got her picture in the mail! My daughter was so happy. Receiving a card in the mail was the highlight of her day! I agree (and am so guilty) that letter writing has become a lost art. 😦 Thank you for your encouraging words about spreading His light and love… what a humbling honor to be told that. What a sweet story. This week was the 3rd year since the kids’ grandfather (“angkong” in Fukien) passed away. They never got to meet him. Your story just melted my heart. I am so sorry about your loss. 😦 I know it can still be so hard… especially during the holidays, when our loved ones absence is felt all the more. As much as my kids miss their grandfather, I do have to remember that they were blessed to know him. They got to go on trips and created many memories (and we have a ton of pictures too). So I am grateful. Thank you for your comment. I hope you had a wonderful Thanksgiving this year with your family.